Monarch butterfly caterpillar Photo credit: Richard Sharell, © Estate of Richard Sharell(used with permission). This problem arises because at times there are too many butterflies laying too many eggs on too few swan plants! It’s as though the butterfly is gambling that at least some of her offspring might somehow get enough food to make it through to the chrysalis stage. If she doesn’t lay eggs on the right food plant they have no chance at all. So what can you do besides buy more swan plants? Well, there is a partial alternative – pumpkin! I say ‘partial alternative’ because only the older, larger caterpillars can make use of it. While smaller caterpillars can feed on pumpkin flesh, pumpkin doesn’t provide everything they need to properly develop. 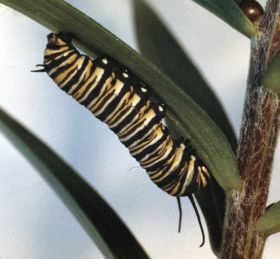 In contrast, larger caterpillars that have been reared on swan plants are likely to have picked up enough of the chemicals they need to undergo metamorphosis. Hi. I’m 14 and just bought a couple of swan plants as I used to love growing caterpillars and butterfly’s when I was younger. They r inside now because I’m letting them grow bigger. My question is : how long approximately does it take for a butterfly to find my swan plants. Based on ur experience. And they have no eggs or caterpillars on them right now. Also I don’t usually see many butterflies around home but there are always some in mid summer. Thanks, Nathan. Hi Nathan – that’s not an easy question to answer because it will depend on how many butterflies are around and how easy it is for them to find your plants. If there are butterflies around you will probably improve your chances if you have more plants. As you said you normally see more butterflies in midsummer, I expect they will find your plants then if they don’t manage it sooner when there are fewer butterflies around. That said, even if you have butterflies and plants in low numbers, you might be lucky and find eggs on them sooner rather than later. Hi thx for the reply! I think I might just get some caterpillars from my nana as she has a bunch of them. I have 2 plants which are both about 60 cm tall. How many caterpillars would u recommend I get. I do want these plants to last and I know caterpillars eat them fast. And the plants have lots of leaves if that helps. Thanks. Your swan plants don’t sound very big, so I wouldn’t go overboard with the caterpillars. Try two per bush and see how that goes. If you find this is having little effect, you may want try adding another caterpillar or two. I’m being a bit cautious here because you said you want the plants to last, presumably as you expect to have butterflies laying eggs on the plants later in the summer. If any readers think I’m being too cautious (or not cautious enough! ), they are welcome to add their advice. You can use raw pumpkin rather than cooked. Hi, was reading about the pumpkin, ok probably silly question but does the pumpkin need to be cooked? Magazin: Is your caterpillar behaving normally? It could simply be a minor colour mutation and nothing to worry about. Even if it was of concern, I’m not sure there’s much anyone could do. I would think 5th instar larvae (that term will make sense once you’ve read the guide) would be best. I’m sure other readers will let you know if they’ve had any luck with younger caterpillars. I know the caterpillars do better on pumpkin when they are big and fat but being my first year having these wee darlings in my garden, what is classed as big and fat. got no leaves left on my one little plant and the plants in the garden shops are tiny, so going to try the pumpkin method but dont want to deform my little guys. Hi, Im hopeing some could help me with a Caterpillar issue the front of its head is discoloured and very yellow, is this something i should be worrying about? Hi I’ve noticed the heads are quite bright yellow after they’ve just shed their skin. Kill off your ants too as they eat the eggs and will take young caterpillars. I’ve even see one bite a green chrysalis and a green liquid bead appeared.. Within a few hrs there was nothing left of it after the ants had finished. We move them to hatch safely under the porch I’ve also read that the blue ladybirds also eat eggs (as well I think the sheild bugs and praying mantis – will eat the caterpillars). Wasps of course are harder to deter. I now just clap them with my hands and step on them to finish them off. I raise small caterpillars inside and put larger outside. You can also get curtain netting from second had shops to cover the plants. I have grown a couple of large Swan Plants in pots inside, put them outside for a couple of weeks over xmas and now have a healthy crop of caterpillars. I’ve bought the pots back inside and I’m culling the caterpillar population, restricting it to 4 per shrub. If the leaves disapear I’ll be tryng the pumpkin method for sure. Saç ekimi ücertleri ve fiyatları hakkında bilgiler içeren web sitesi. The drawback with that method is that depending on the withholding period for the plants, the female Monarch doesn’t know and lays her eggs on a plant which is still affected by pesticide residue. Result can be writhing caterpillars, dying, upset children etc. Our recommendation would be to use a net to cover the plants. Later, when they’re bigger, the Monarch can still lay – either on leaves just inside the net or she can slip her ovipositor through the mesh, and the wasps can’t get at the eggs/small larvae. While tis method may seem distasteful to some, I’ve tried it and it works well. While the Swan plant is growing, I spray it with insecticide to keep the caterpillars from destroying the plant in its early stages. Once the plant has developed into a bush, essentially, I stop spraying it and the monarchs do their thing. Giving the plants a head start makes them much more likely to survive. Before I did this, the caterpillars would demolish the plants before they could get to the chrysalis stage. So it was a lose-lose situation. I presume you’re talking about a Monarch caterpillar? Can I suggest that you go to the forum on the Monarch Butterfly NZ Trust website, and I’m sure some of the members will be able to give you good advice. Thanks for the update. Your account seems to back up the reports that switching from a swan plant diet too early can affect later development. As you’ve observed, those big, late-stage caterpillars are the best ones to switch to pumpkin. Well to report back on my catepillars, a couple of them just didn’t make it to the chriysilis stage (around 4-6) they just curled up and died. Of those that turned, a couple made really weird chrysilis’ which died afterwards, and one butterfly came out with very deformed wings which wouldn’t uincurl. I would say we had around 50% sucess rate. I did notice that the chrysilis’ were smaller than those from 100% swan plant fed catepillars, but in general the longer you can keep the catepillars on the swan plants, the better. Next year when I get too many catepillars, I would definately use pumpkin again for those big fat catepillars who just munch everything in sight, and reserve the swan plants for the smaller catepillars (nursery). It can be a bit random. Some years people see plenty of monarchs, other years few to none. I guess your plants just haven’t been spotted by any egg-laden monarch butterfly females. You might like to go to the forum on http://www.monarch.org.nz for some ideas. I think that probably what is happening is that there are eggs on your plants, and that the wasps are taking them all. But very soon the wasps will change their diet from protein to nectar, and leave the Monarch caterpillars alone. At that stage you will (should) have lots of Monarchs. There is some information about wasps on our website under ‘Pests’. We had loads of monarchs last summer, and ended up having the plants striped bare. This year we planted even more plants, but haven’t had any eggs laid on them. Well one of my catepillar’s fed on pumpkin is now a chrysilis this morning, and the others are still going nuts on the pumpkin. They really get excited when they get a fresh batch of pumpkin put in. I’ll update further when they hatch out. It sure is a cheaper, hassel free alternative to get the catepillars through that “hungry” stage. I forgot to mention, I change the pumpkin each day (which has been kept in the fridge) and clean out all the poo! Thanks for that Karyne. Keep us posted on how things turn out. I’ve had 16 caterpillars from their 3rd shed onward on slivers of pumpkin (green butternut) in icecream containers. They really enjoy it and when I try to put them back onto the regenerated swan plants, they are not interested anymore. I’ve laid the lid over them so air can still circulate and I’ve already got one formed into a “J”, waiting to turn into its chrysilis. I’ll update later on the sucess rate, but am pleased to have saved my catepillars. You can still see the cinnabar moth out here in NZ. It was imported as a biological control agent for ragwort. While it’s not exactly a common sight, every summer I get a number of reports from people wanting to know what this strikingly coloured moth is. This reminded me of my time as a child here in the U.K. I used to collect “Ragwort Tigers”, the caterpillars of the Cinnabar Moth (Tyria jacobaeae)which were commonly found on Ragwort (Senecio jacobaea), a common field and garden weed. However, today this is a “Notifiable Weed”, I believe because it is poisonous to animals (notably Horses), and is therefore rarely seen. Sadly, the “Tigers” have all but dissappeared, too. You’re quite right about Araujia sericifera being another alternative food. However, you’re also correct to point out that it’s a pest and that’s exactly why I didn’t cover it. Depending on your regional council’s rules, it may be OK to transfer caterpillars to plants that are in the field. However,as far as I can see it wouldn’t be OK to take this or any other NPPA listed plants home with you. Another possibilitiy involves a pest of a weed, found on the edge of wasteland, e.g. building sites, particularly in the north of NZ: Araujia sericifera. In some regions it’s listed as a noxious weed – so check out what your regional council has to say about it. Here in Russell, Bay of Islands, we lost most of our swan plant (milkweed) over the wet, windy winter last year, and in September the Monarchs had laid a profusion of eggs. So I took the tiny caterpillars and put them on Araujia sericifera – sometimes referred to as moth vine, cruel plant, kapok vine – and they thrived, most of them pupating successfully.